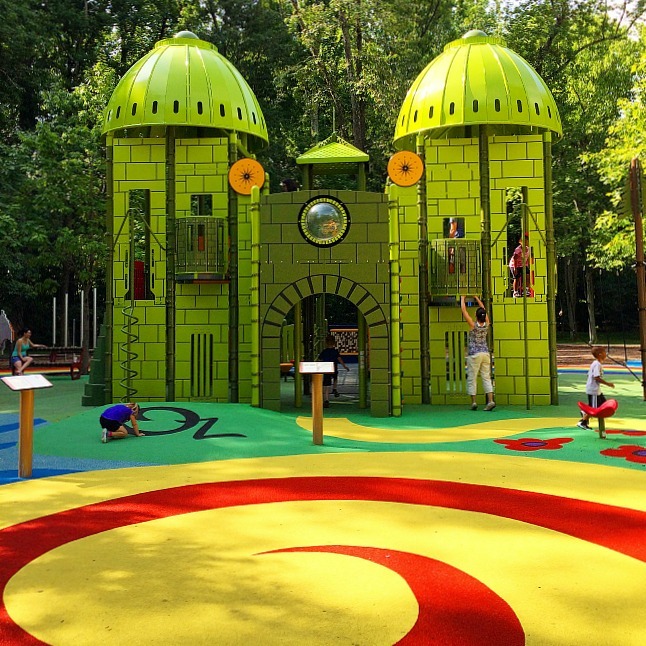 These Nine Prince George’s County Imagination Playgrounds Are Simply Amazing! 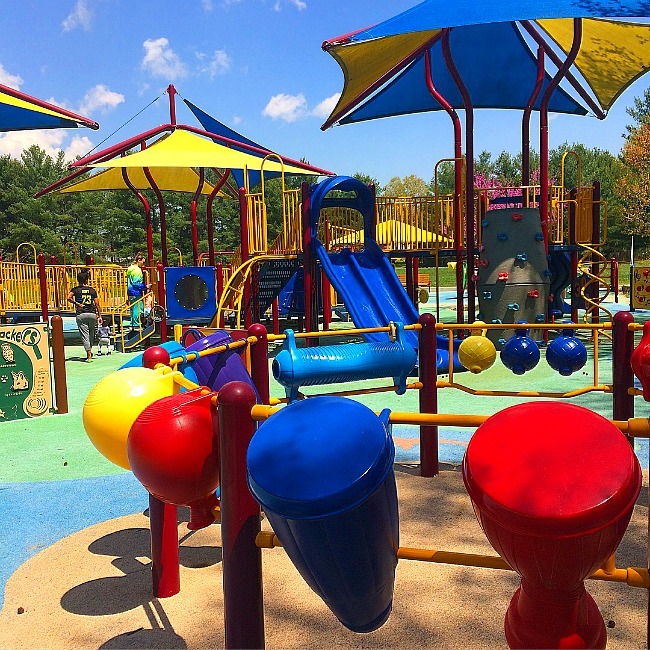 There are 25 Imagination Playgrounds in Prince George’s County. 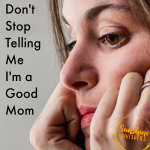 We have been to all 25 and they are all great. But these nine are the absolute best! So, we did it. 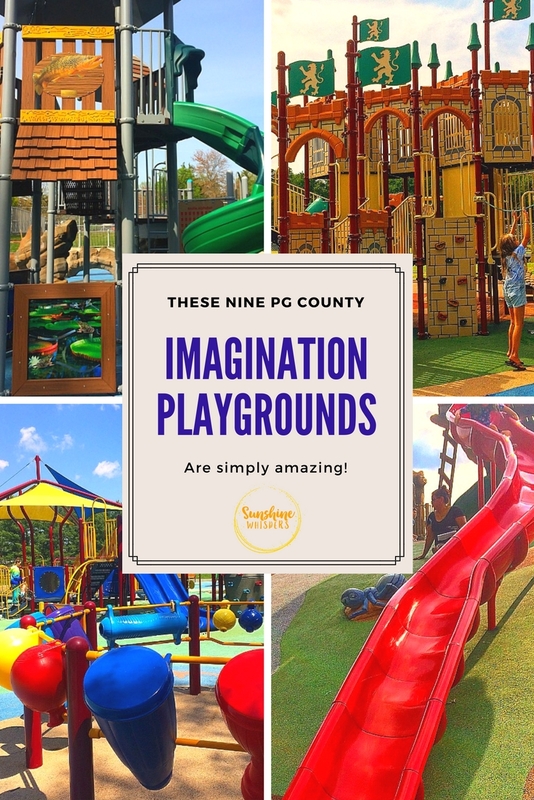 There are 25 Imagination Playgrounds in Prince George’s County and after 2 years of consistent effort, we recently checked the last one off of our list. Spoiler Alert: THEY ARE AWESOME! 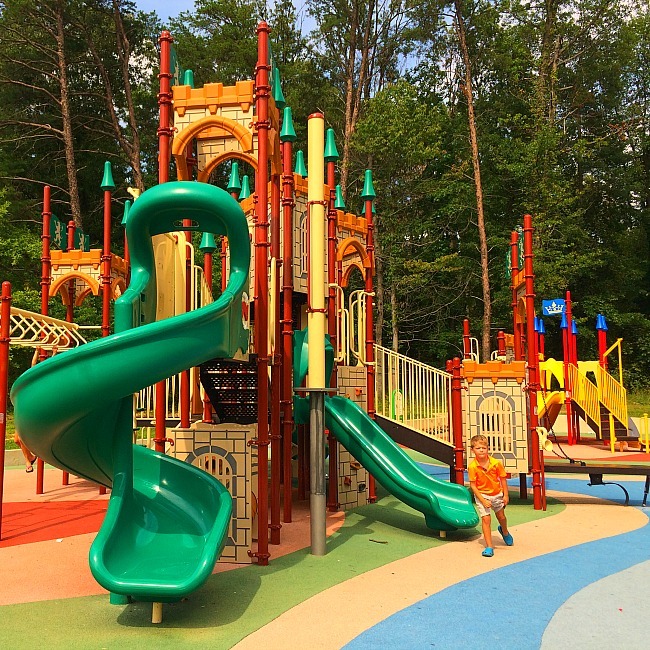 Prince George’s County did such a fantastic thing for their residents and really anyone who is within driving distance of these playgrounds because many of them are absolutely delightful and they definitely spark the imagination for both kids and the adults who visit to play with them. But where do you start? Which playgrounds are the best? Do they have slides? How about public restrooms? Well, I have got you covered. This is part one of four that will review all 25 of these playgrounds and give you our recommendations. The attention to detail with this playground is amazing. Ruby Red Slippers, the house in Kansas complete with Aunt Em’s mailbox, and a real yellow brick road. For real. The play area itself is sunny but is surrounded by a wooded, shaded picnic area. There is plenty of parking. The actual playground parking lot fills up fast but about 1/4 mile away, there is plenty of parking at the Watkins Nature Center. 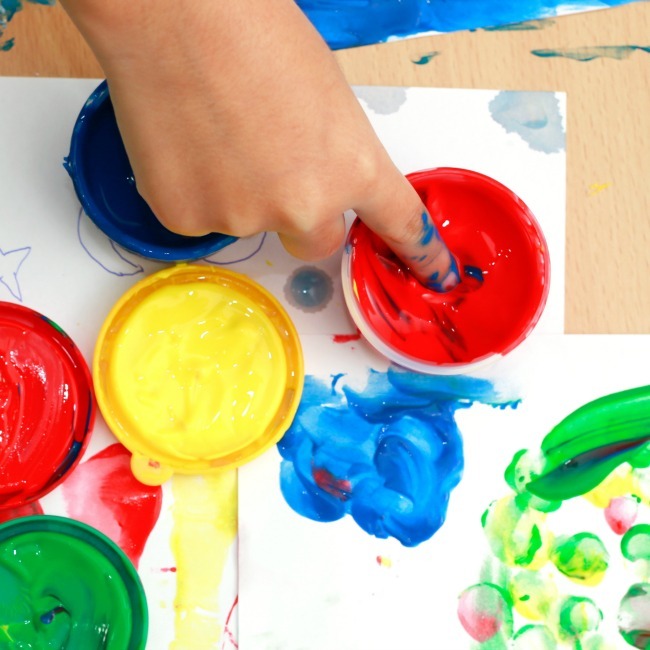 There are tons of play features for toddlers and young kids, as well as older kids. The playground is designed for kids up to 12. There is a lot going on at this playground so it might be difficult to completely keep track of your kids. However, the play area is relatively self-contained, so it isn’t overly difficult. The rest of Watkins Regional Park is super fun. You could really spend all day at this fantastic park! 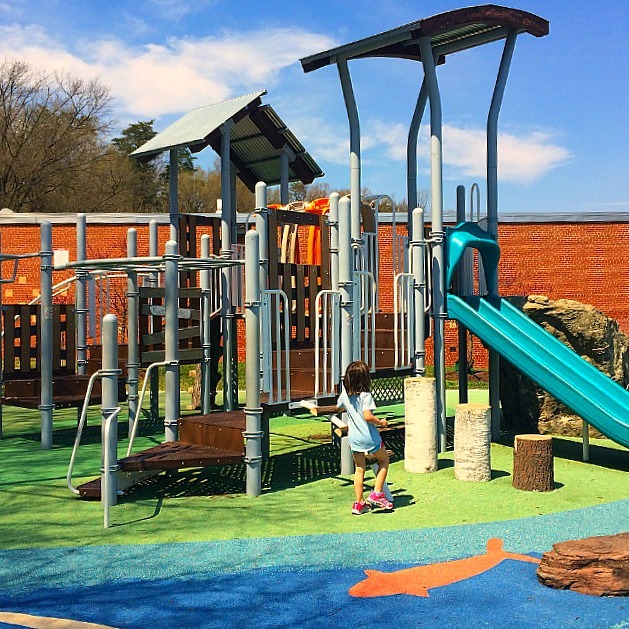 Located at the Walker Mill Regional Park, this playground has a lot going on… and your kids will LOVE playing here. Yes, this playground is HUGE. There are multiple sections of the play area. One of the playground sections is a spray-ground. It is really cute and your kids will love getting sprayed by woodland animals or sliding down a little water slide. There are plenty of swings at this playground but your kids might be too busy to care about them. There are play areas for older kids and young kids. They are in separate sections of the playground… but I am not going to lie; your young kids will want to play in the big kid area too. Climbing– kids can climb through a hollowed out tree, scale up a big boulder, climb up a water tower. And then slide all the way down the hill. This slide is probably my favorite feature of the playground. It is sooo long! And kids won’t mind climbing back up the hill because there are some cute ants who will crawl up the hill with them! One downside to this playground is that it is super popular, which means on weekends and nice days it can be totally overrun with kids. 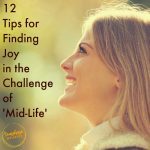 However, even when its busy, you will likely have a fantastic time playing. There are public restroom facilities at this playground. There is ample parking nearby. Note: The playground is actually on top of a hill. There is a wide, paved path which is very stroller friendly, but it is up a relatively steep hill. The hill makes the long slide possible. If you have older kids, there is a skate park adjacent to the playground. This playground is appropriate for all ages, but you might want a one-to-one ratio for kids because it can get super busy. This playground at Fairwood Park is massive and fun not just for older kids but also smaller kids. The huge play structure pictured below is actually three play structures connected to each other. There are two massive parts with slides, tunnels, and places to climb. In between is one of those large climbing web knots that are starting to show up on newer playgrounds. This playground has play areas for both older kids and younger kids. The play area is large and spread out. There are swings, tons of slides, many climbing structures, a sand box area, and a number of other special features for spinning and balancing. NEOS: This feature part game, part sport. 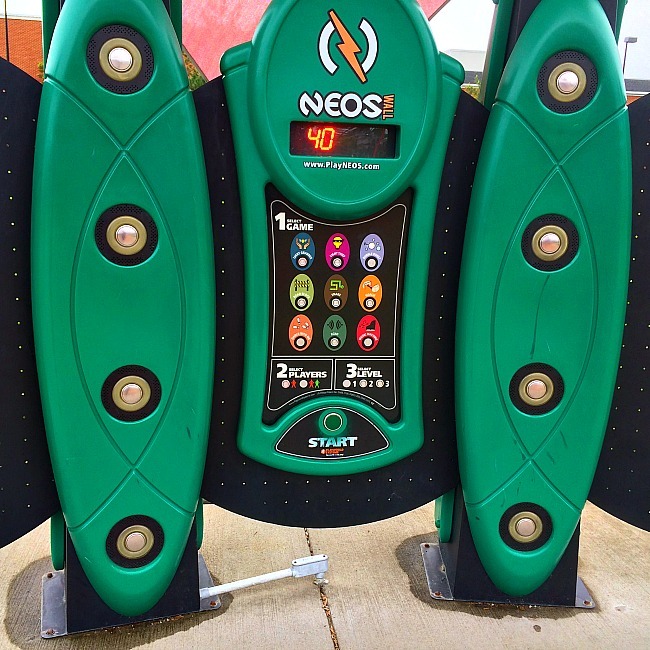 NEOS is an electronic game/sport which seems a lot like a giant game of Simon. You can choose from 9 games, up to 2 players at a time, and various levels of play. Each game uses sound and/or light to get game players moving and thinking. This playground is in the middle of a large open area park with tons of space for running around. This park is behind a Safeway, so there is plenty of parking, and the parking is close. This seems like a very safe park and playground. 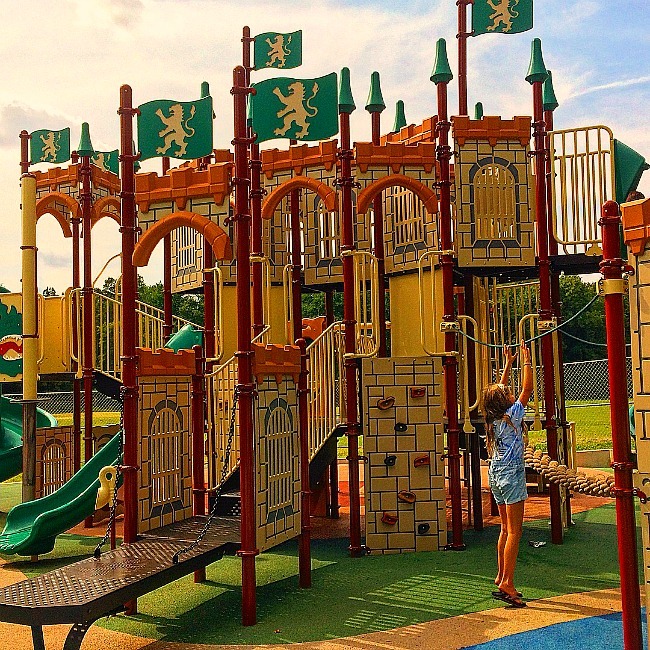 Your kids will love pretending they are royalty with this fantastically themed playground located at the Cheverly Euclid Street Neighborhood Park. This playground is perfect for imagination. Kids can climb to the top of the castle, walk over the moat, scale ropes over treacherous waters, and pretend they are royalty. There are separate areas for younger and older kids but the older kid area is still mostly doable for younger kids. There are tennis courts and ball fields adjacent to the playground as well, so plenty of opportunities for kids to run around. Also next to the playground is a great wooded area with a short walking path. When we visited there were kids running around playing prince and princess and dragon through the woods. It was awesome. This park is tucked away in the back of a residential area. It seemed very safe and secluded. Great for younger kids. There were swings for big kids, toddlers, and kids with disabilities. This was the last Imagination Playground we visited and I can’t believe we saved one of the best ones for last! Seriously, this fully accessible playground is so bright and happy and there are so many play features to love. 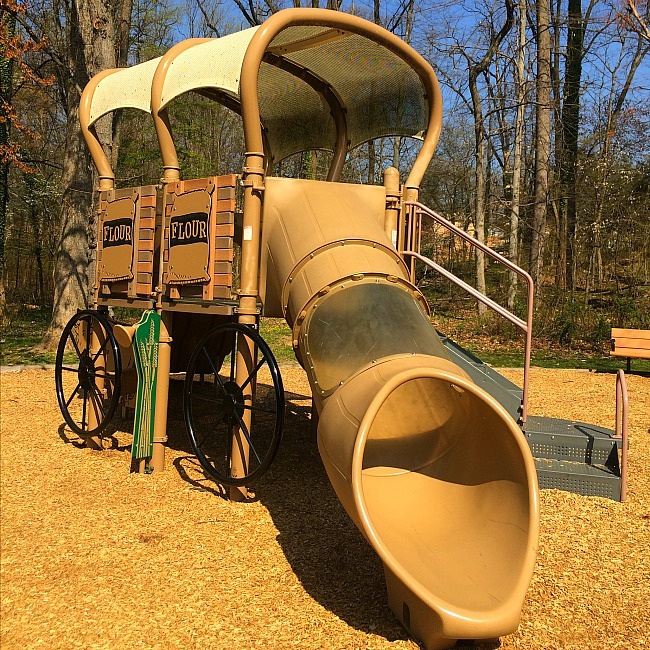 This is the first universally designed, fully accessible playground in Prince George’s County and they really go all out for kids of all ages and abilities. 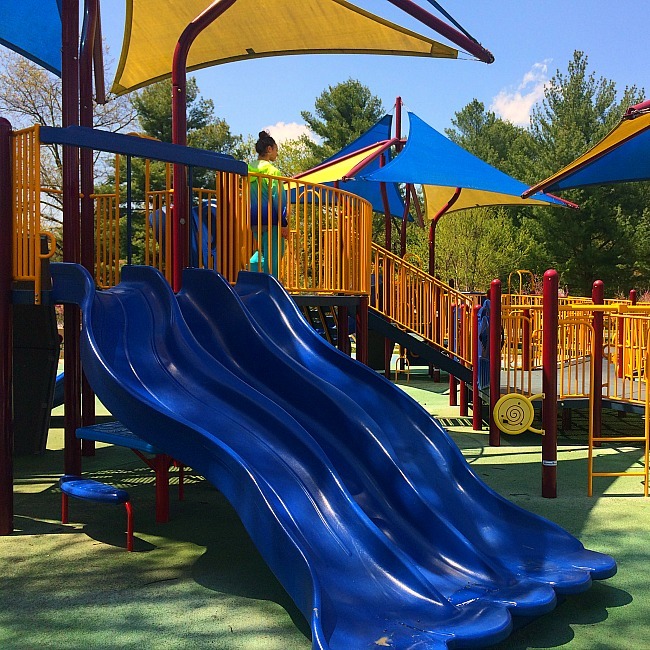 For kids with mobility issues, there are two wheelchair-accessible double “SwayFun” swings, as well as wheelchair ramps, plenty of shade, and sound panels. Lots of swings. 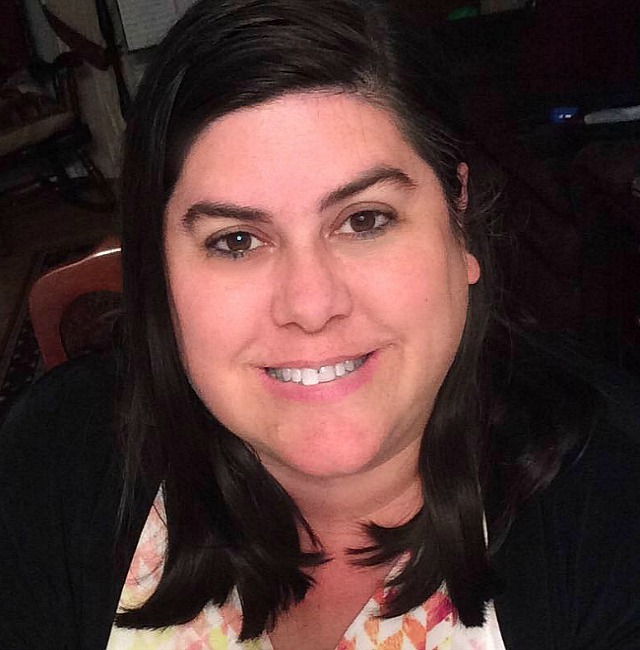 In addition to the swayfun swings, there are swings for big kids, toddlers, a tire swing, and other swings that accommodate kids with special needs. I love the sound/drum circle. The drums and other noise makers are brightly colored and there are numerous varieties of drums. If you had multiple kids playing at the same time they could really make some noise! This a lovely themed playground with tons of tunnels and nooks and crannies that will encourage a game of tag or hide and go seek. The location, tucked into a neighborhood park and adjacent to a school, is very safe. There is plenty of parking right next to the playground. We didn’t see any potties though– no public restrooms or port a potties. There are fields plus tennis and basketball courts co-located with the playground. 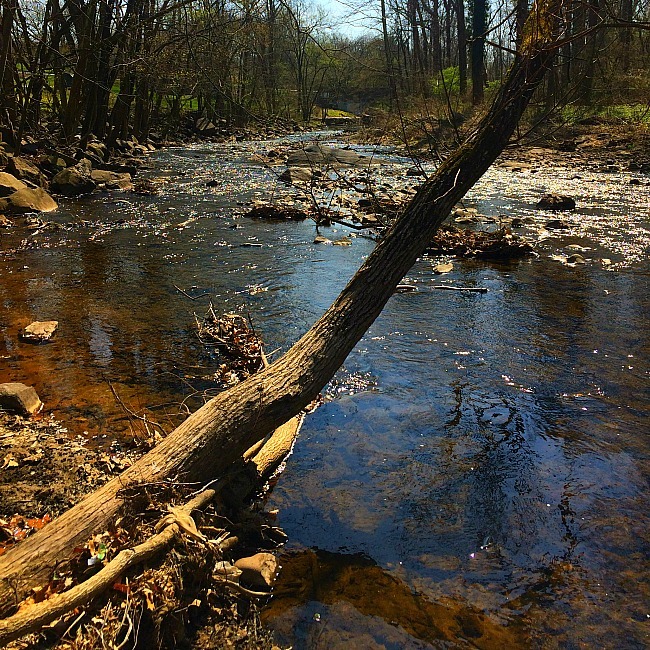 Generically referred to as Watkins Regional Park Playground #2, this hidden (well hidden) gem is an amazing playground in its own right. The only downside really is that it plays second fiddle to the Wizard of Oz playground. But seriously, it is a pretty fantastic playground. 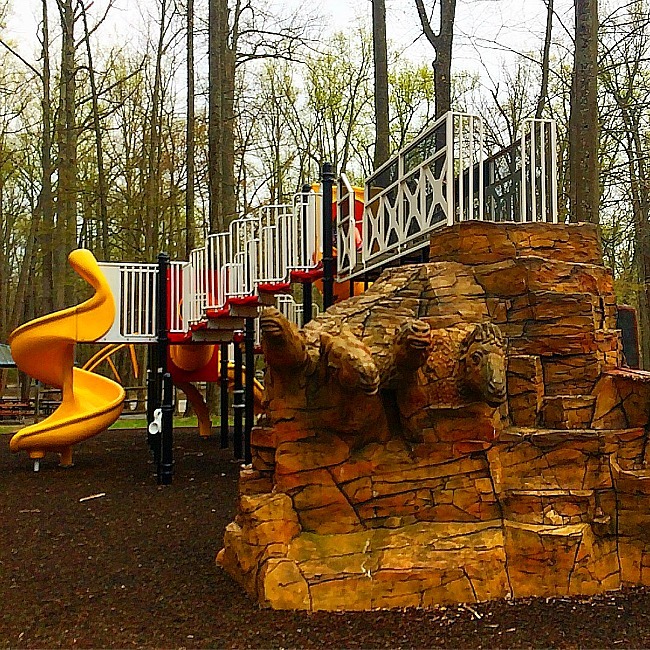 Related: Check out the Best Playgrounds in Maryland- Part Two! There is plenty of parking and the remote location in the back of Watkins Regional Park makes this playground super safe. There are public restrooms at the entrance/exit to the playground/picnic area and there are additional public restrooms at the end of the picnic area loop, which is basically at the other end of the playground. Picnic pavillions line the playground area. This area is very shady because of the tall and plentiful trees. The horse racing theme doesn’t seem like it should be cool, but it is. There are four horses carved into the end of the main play structure, just begging kids to climb up. The ride-ons and even the younger kid area are all themed for horse racing. There are swings for big kids, toddlers, and kids with mobility issues. 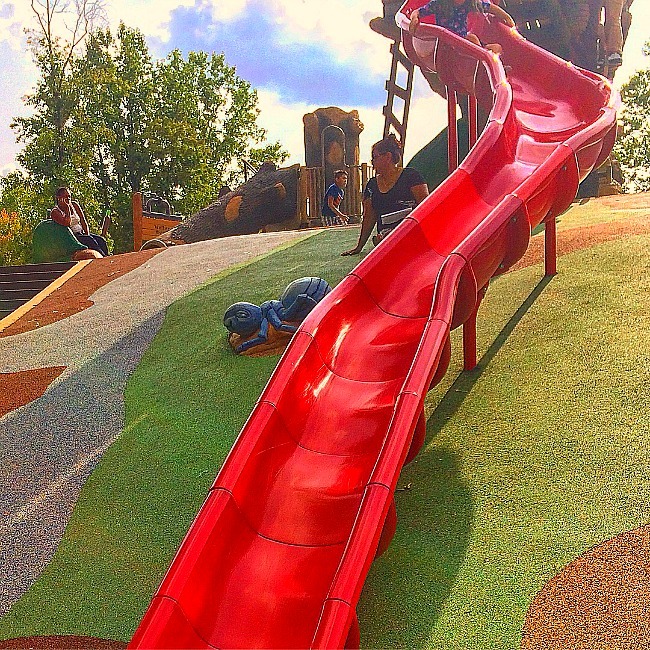 The slides at this playground seem like a lot of fun… for kids of all ages. There are plenty of benches and great line of site to pretty much the entire playground. Big and little kid areas are separate but your little kids will definitely want to play in the big kid area too. I wasn’t expecting much from this playground but boy was I proven wrong. This lovely playground is next to a community center and it has a lot to offer all kids. The theme is very fun and the playground is designed around the idea that you are near the water. 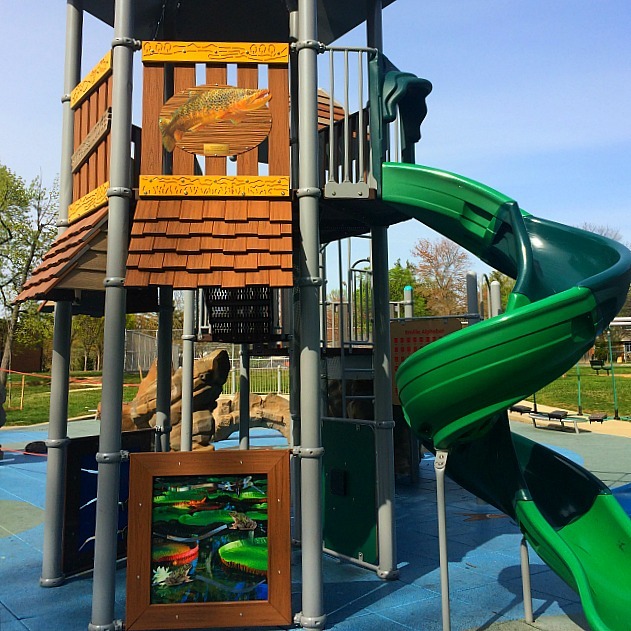 Kids can spot sharks and other fish in the play area, and many of the play features have a fishing theme. Next to the playground there is a short walking path and ball fields that would be great for running and burning energy. 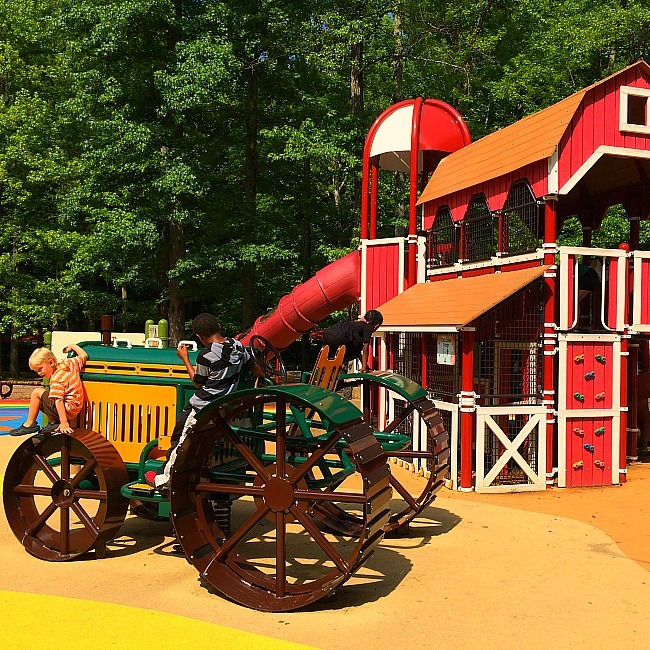 The imagination playground is built among two older playground areas– all three are a lot of fun. The tot lot area is far enough away from the older kid area that your toddlers won’t be completely tempted to wander. We didn’t see public restrooms or port-a-potties but I imagine there are some inside the community center that is next to the playground. 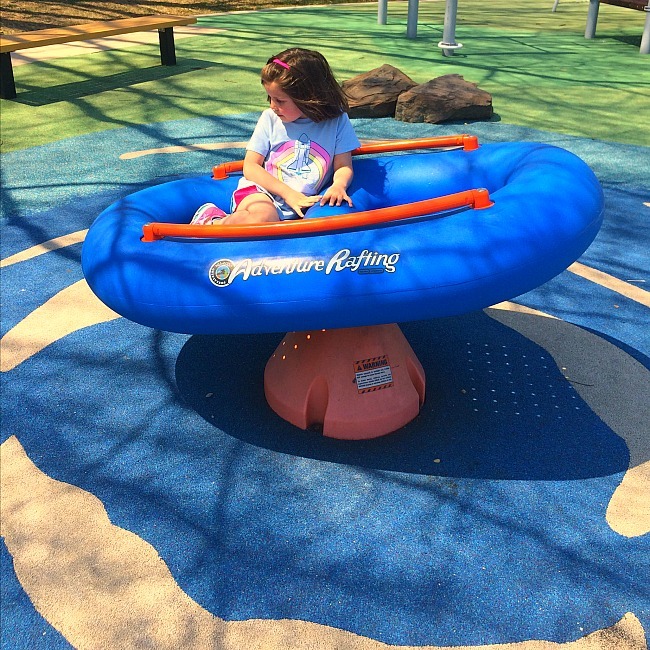 There are a number of unique play features for balancing, climbing, and spinning– including a giant ring that kids can ride and spin around on. 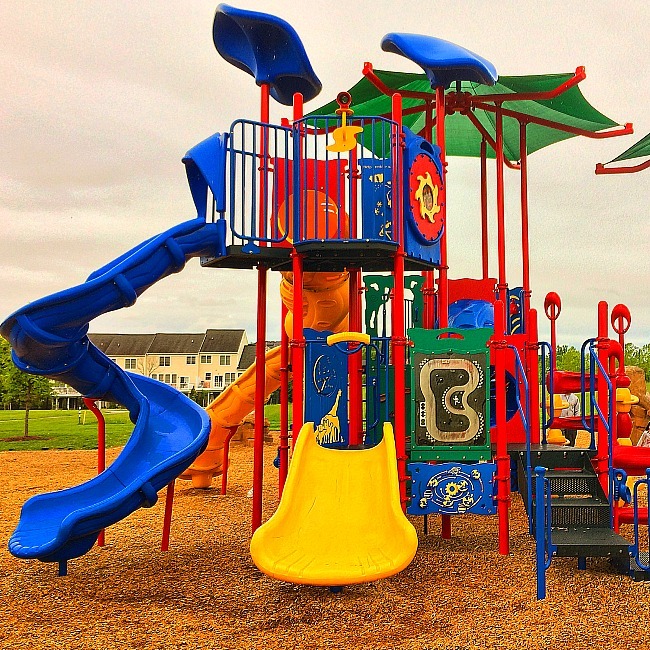 This playground boasts tons of slides and swings for both older kids and toddlers. We were not expecting this imagination playground to be so cool. But that is the thing about most of these playgrounds; you don’t expect to be delighted but you are.. pretty much every time! This theme was really interesting. As you can see (above) you kids can actually ride on a whitewater adventure raft. It actually simulates riding the rapids (with you help of course) and I thought it really was a unique play feature. The rest of the theme is pretty interesting too. If you had a few kids playing at the same time (we were the only ones there), they could come up with some great adventures I am sure! There are weather station panels in the young kid area that talk about the rain cycle, relative temperatures, and other weather related concepts. I didn’t see toddler swings, but there are two big kid swings. The only downside is that they are currently adjusted very low… so low in fact that my 5-year old had a hard time actually using them. There are plenty of slides of varying heights. Older and younger kid areas are both great, but all kids will likely want to play on all the play features. There is a great tree stump balance play feature. 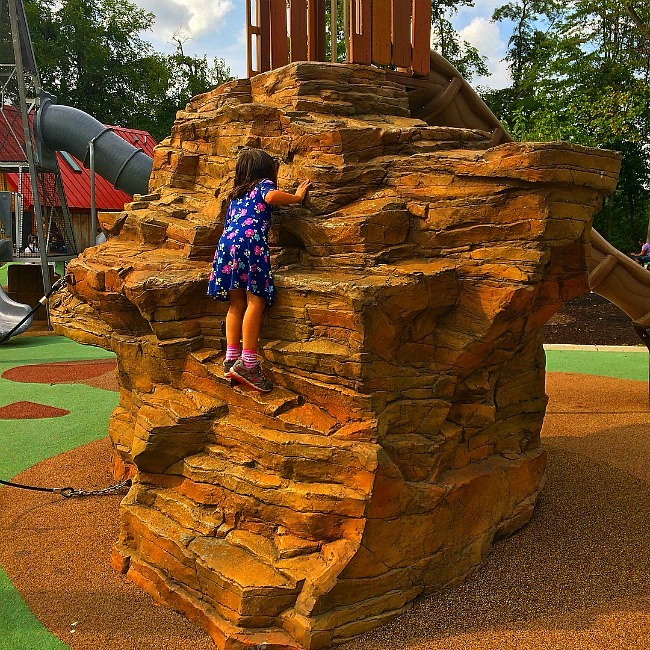 Kids can climb up boulders or a short (but long) climbing wall. There is a fun see-saw play feature for younger kids too! There is plenty of parking and the playground seemed safe. It is co-located with a building that I think is part community center, part municipal police station. So yeah… that should be safe. There are benches for sitting and there is some shade as well. We didn’t see public restrooms but the playground is located next to a community building so I imagine there are some inside. This playground is tucked away, off a busy road. But the theme is super cute, and it is a great launching point for other adventures! There is plenty of parking and the parking is right next to the playground. We did not see any public restrooms or port-a-potties though. Still, the playground was very safe, direct line of sight for caregivers, and small enough that your kids won’t get lost. There were swings for big kids and toddlers. The theme is pretty neat– there is actually a stagecoach play structure. There are areas for older and younger kids but none of the play features will be too overwhelming for younger kids. There are tables that line the playground with chess/checker boards on them, which is a nice feature. My daughter’s favorite feature was a spinner which she played on for about 20 minutes straight! This playground features plenty of places for caregivers to sit and lots of shade. One of the best things about this playground though is that it is situated next to a bike path that follows a river. We loved walking down to the river, throwing rocks in, and just enjoying the water. All of these playgrounds are FREE. As in, zero cost to get in. That is pretty cool. Don’t forget to bring snacks, an extra change of clothes, sunscreen, bug spray, and water. The playgrounds are located in a wide variety of neighborhoods, but we felt safe at each playground. 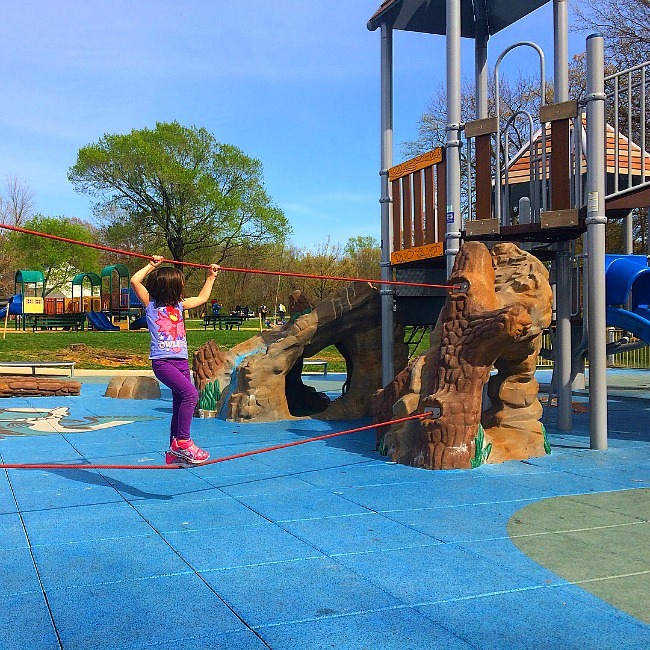 Some of the best impromptu play dates were at the playgrounds inside denser neighborhoods! Click below for the Google Map to all playgrounds listed in this post.